Researchers recovered fluids from beneath the seafloor using specialized deep-sea sampling platforms, shown above being deployed from a research vessel and below on-board the ship with UCSC ocean scientist Matt McCarthy. 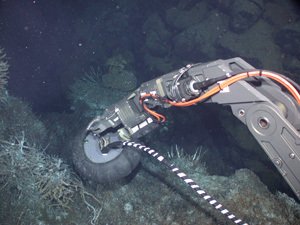 A robotic arm from the ROV Jason II deployed sampling equipment on the seafloor. All photos courtesy of M. McCarthy. Researchers have found compelling evidence for an extensive biological community living in porous rock deep beneath the seafloor. The microbes in this hidden world appear to be an important source of dissolved organic matter in deep ocean water, a finding that could dramatically change ideas about the ocean carbon cycle. Matthew McCarthy, associate professor of ocean sciences at the University of California, Santa Cruz, led a team of researchers from several institutions who analyzed the dissolved organic matter in fluids from natural vents on the seafloor and from a borehole that penetrated the basement rock deep beneath the seafloor sediments. Their results, to be published in the January issue of Nature Geoscience and currently available online, indicate that the dissolved material in those fluids was synthesized by microbes living in the porous basalt rock of the upper oceanic crust. These microbes are "chemoautotrophic," meaning they derive energy from chemical reactions and are completely independent of the sunlight-driven life on the surface of our planet. Chemoautotrophic microbes (bacteria and archaea) have been found in deep-ocean sediments and at hydrothermal vents, where hot water flows out through newly formed volcanic rock at mid-ocean ridges. The idea that a much larger biological community might exist in habitats within the cooler upper-crustal rock that lies under large areas of the seafloor has been an exciting, but controversial, hypothesis, McCarthy said. "What is really important about this is the huge size and extent of such systems," he said. "This study provides the strongest evidence yet that a really large biosphere exists in the warm fluids in the porous upper-oceanic crust. It's large not just in area, but in productivity. In the same way that forests and grasslands fix carbon and produce organic matter on land, our data suggest these microbes produce enough organic matter to export carbon to other systems. That's a real expansion of our ideas about the oceanic carbon cycle." The existence of an extensive "alternate biosphere" beneath the ocean floor may also influence the thinking of astrobiologists about where life might exist elsewhere in our solar system, McCarthy said. Jupiter's moon Europa, for example, is thought to have liquid oceans beneath its icy crust, prompting speculation about the possibility of life evolving there. McCarthy's team found evidence of the hidden microbial ecosystem beneath the seafloor by analyzing carbon isotopes in the organic molecules in their samples. Of the three naturally occurring isotopes of carbon, carbon-12 is the most abundant, and both carbon-12 and the slightly heavier carbon-13 are stable. Carbon-14 is an unstable isotope formed in the upper atmosphere through the action of cosmic rays, and its steady decay is the basis for carbon-dating of organic material. The ratios of these different isotopes provide telltale clues to the origins of organic molecules and the carbon atoms in them. Carbon-13 analysis, for example, indicates what kind of organisms synthesized the molecules. "Carbon-13 is really useful for looking at the origins of organic matter, because there are distinctive signatures for different sources," McCarthy said. "Chemosynthetic bacteria have wildly different signatures than anything else, and our carbon-13 results match the classic chemosynthetic values." The team's carbon-14 analysis showed where the carbon in the organic molecules came from. If it came from the carbon in crustal rocks, there would be no carbon-14 at all. Instead, the carbon-14 signature indicated that the carbon came from dissolved inorganic carbon in deep seawater. This inorganic carbon pool consists of carbonate ions formed when carbon dioxide from the atmosphere dissolves in ocean water. Carbon-14 dating indicated that the carbon in the dissolved organic matter is 11,800 to 14,400 years old--in other words, that's how long ago the carbon now in those organic molecules was absorbed from the atmosphere into the ocean. That's about three times older than the carbon-14 age of the overall pool of dissolved organic matter in the deep ocean. This suggests that water circulates very slowly through the deep microbial habitat in the rocks of the upper crust. 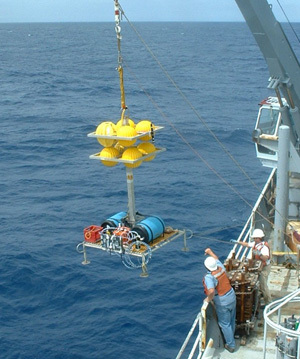 "The observation that this deep biosphere is apparently pumping very old, carbon-14-depleted dissolved organic matter into the deep ocean may be very important to our understanding of biogeochemical cycles," McCarthy said. "The reservoir of dissolved organic matter in the deep ocean is one of the largest active pools of organic carbon in the global carbon cycle, about the same size as the pool of atmospheric carbon dioxide." The age of the deep-ocean water is used to estimate how quickly it turns over and returns to the surface layers. "If this very old pool of carbon is being mixed in and biasing the measurements, the deep-ocean water may actually be turning over more quickly than we thought," McCarthy said. To obtain their samples, the researchers used custom-built equipment and a remotely operated deep-sea submersible, the ROV Jason II, from Woods Hole Oceanographic Institution (WHOI). Stainless-steel probes driven into an exposed rock outcrop and a specialized set of deep-sea sampling platforms designed at the University of Washington (UW) enabled them to recover the unprecedented quantities of uncontaminated crustal fluids needed for the analyses. The samples were collected during two expeditions to the Juan de Fuca Ridge system off the coast of Washington and British Columbia. The key carbon-14 measurements on the recovered organic molecules were done through collaborations with the Lawrence Livermore National Laboratory's accelerator facility and the Keck Carbon Cycle Accelerator facility at UC Irvine. In addition to McCarthy, the coauthors include Steven Beaupré of WHOI; UCSC graduate student Brett Walker; Ian Voparil of Shell International Exploration and Production; Thomas Guilderson of Lawrence Livermore National Laboratory; and Ellen Druffel of UC Irvine. 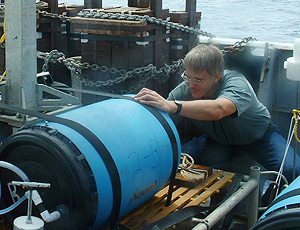 H. Paul Johnson and Tor Bjorkland of the UW School of Oceanography were instrumental in the development and deployment of deep-sea samplers and probes. This research was supported by the National Science Foundation, the University of California, and the Packard Foundation.